Taken from Classic Elite Pattern Books - 9148 Crestone & Vista: "Garter stitch wrap worked sideways with tapered ends." 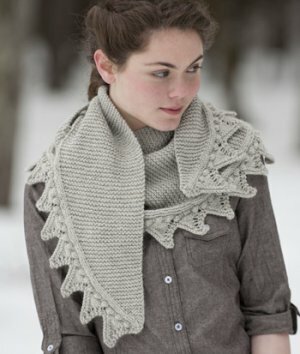 This pattern is in Classic Elite Pattern Books - 9148 Crestone & Vista, page 11. Finished Measurements: 62" wide x 11" deep at center, blocked. Color Shown is #6003 Ash.